This week's see another packed weekend of grappling action across the country. 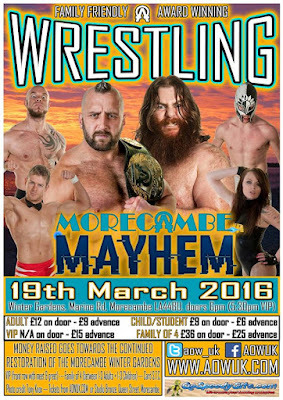 In this week's look at some of the shows coming up, we head back to The Planet Nightclub in Wolvehampton, the move on to Morecambe for guaranteed mayhem before ending the weekend with a history-making event in London. Let's get Ready For The Weekend! Up first this weekend and Fight Club: PRO are back at The Planet Nightclub in Wolverhampton with Rise Against. The event shall see Clint Margera in a Death Match against AIW star, Rickey Shane Page. Originally, Margera was penciled to face Pete Dunne. However, Dunne refused to compete in a Death Match so found a replacement in Page who we are sure will have no issues with it. Speaking of Dunne, while he might have escaped a match with Margera, he's now found himself in a bout with Dave Mastiff. A former Fight Club: PRO Champion, Mastiff is one of the most dominating forces in British Wrestling. Dunne could find it's a case of out of the frying pan and into the fire this Friday night. In recent months, The Hunter Brothers and the duo of Dan Moloney & Wild Boar have developed quite the rivalry in FCP. However, Moloney & Boar have now informed FCP management that they will not be facing Hunters Brothers again until they have shown that they deserve a match with them. Hunter Brothers are happy to prove their worth and shall now face KYS member's Damian Dunne and the reigning Fight Club: PRO Champion, MK McKinnan in a tag team match on March 18th. If Hunter Brothers need to prove they are worthy of another match with Moloney &Boar then a win over a champion and two members of KYS should be a very good start. 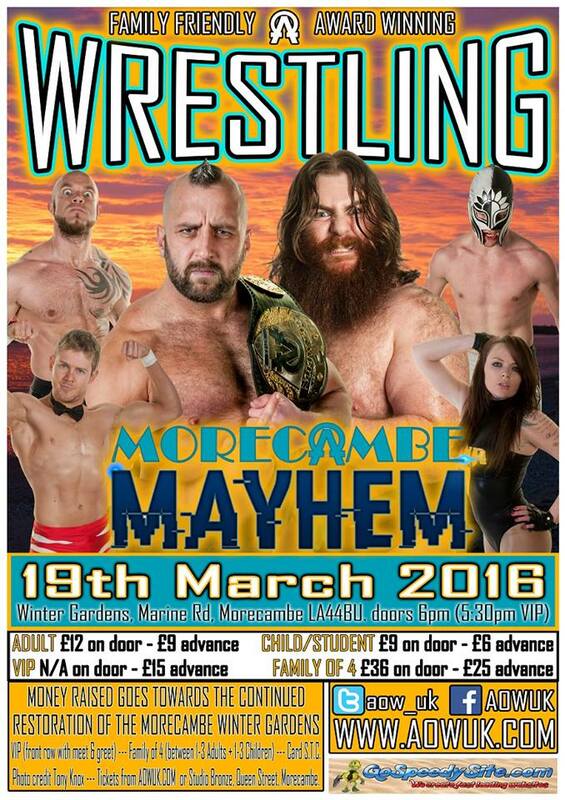 Moving on to Saturday and The Winter Gardens in Morecambe see Alpha Omega Wrestling back in action with Morecambe Mayhem. March 19th shall see the AOW Women's Championship on the line except that the champion shall not be present. Viper is currently on tour in Japan which left Nikki Storm (literally) holding the championship while she's gone. Well Alpha Male, Stallion has now announced that 'The Best In The Galaxy' will be defending the championship against Lana Austin for Viper as well. Nobody in The Referendum is happy, including the champion. Lana could become the champion without the real champion even being in the same continent this Saturday. If The Referendum didn't have enough to worry them, the AOW Tag Team Championship shall also be defended in Morecambe by Bobby Roberts and Lewis Girvan. Their opponents? Well only Stallion knows who they are and has no plans on letting on before March 19th. Roberts & Girvan are walking into the unknown and may end up walking as former champions. Originally, Johnny Phere and Mikey Whiplash were scheduled to compete while Big Damo would face Stixx in two separate matches. However an injury to Stixx left Damo without a match for this Saturday. So AOW management took an unfortunate event and turned it into something great. They've announced that Phere, Whiplash and Damo will now compete in a triple threat match where the winner will be named the number one contender to the AOW Championship which is currently held by Stixx. The stakes have just been raised for this Saturday. The Referendum (Bobby Roberts & Lewis Girvan) (c) vs ??? & ??? 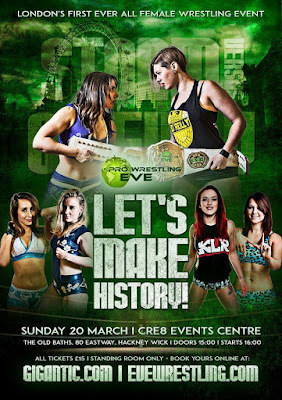 And finally on Sunday, Pro Wrestling:EVE returns and shall make history when they host the first ever all-female wrestling event in London. 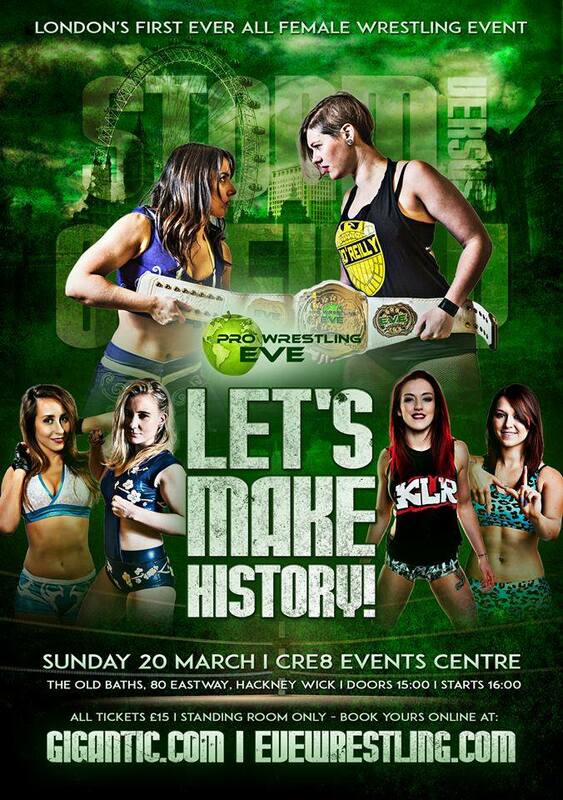 PW:E have stacked this show with competitors from over half a dozen nations taking part. Two nations represented will be Portugal and Germany as Shanna faces Blue Nikita. Shanna is a world-travelled competitor while Blue is one of the foundations of female wrestling in Europe today. Let's make some history with some international flavour added to it. The show will also mark Courtney's debut within the company. Her first appearance won't be an easy one as she faces a woman dubbed 'the baddest woman on the planet', April Davids. 'The Lancashire Terrier' is known for her dominating offence and should be a good match for Courtney who herself is known for blending wrestling with kickboxing. Two wrestlers known for blending their arts into one should be a great match up. A few weeks ago, Nikki Storm became the only three-time Pro Wrestling: EVE Champion after defeating Rhia O'Reilly. However the win can by way of a referee stoppage. Rhia was understandably very angry at the way she lost and demanded a rematch. PW:E have granted the rematch with the stipulation that the match will be a No Disqualification, 2 out of 3 falls Match. Also announced is the inclusion of 'The Female Fight Machine Jenny Sjödin as a Special Enforcer in an attempt to keep some order in the match. Two of the hardest-hitting competitors in PW:E history are going to war this Sunday in London.